Professional webhosting that is 100% on the SSD and with 24/7 support. Buy the best selling hosting in the Czech Republic in 2011 - 2018. Treat yourself to a high performance, stability and quality! Web site with www. and without www. ***) We don't currently provide an IPv6 address for a new webhosting. IPv6 address will be launched and put additionally as soon as possible. Webhosting NoLimit can be ordered for any 2 level domain , even for domains that we do not register too (eg. DE, IT, ONLINE, TOP, ...) - they can remain at the current registrar, just change the DNS servers on ours. New (EU, PL, SK) free domain for 1 year! 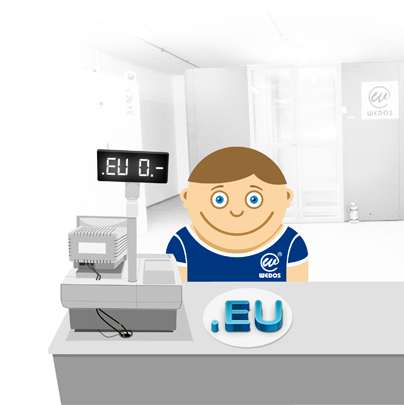 When you order and pay for "NoLimit" or "NoLimit Extra" webhosting for a new (EU, PL, SK) domain, we will register this domain free for 1 year. Pack your bags and transfer serices to WEDOS !!! If you are transfering your website form competitors to us, you get bonus period from us which corresponds to double remaining period of our competitors. We will be glad to advice you with site transfer. Site transfer is easy and without downtimes! Move your site to professionals! You will be pleased! Become our fan and get discount coupons for ours services. Read responses of our customers. We are the fastest growing company in the field in the Czech Republic (since December 2010), our services are constantly improving with improved customer service. We believe that you will be our satisfied customer too. Although we operate on the market for a relatively short period of time,we are already ranked among the three largest companies in the field of hosting in the Czech Republic, thanks to the quality of our services (smooth operation, professional customer support, full automation...). We have incredibly high ​​PHP values with possibility of changes. From our experiance, the other competitors do not have the same values for the same prices)!!! Buy the best selling Czech webhosting. Treat yourself to a high performance, stability and quality! Unlimited number of domain aliases (with help of .htaccess you can have a different website for each domain, ie. you can host unlimited number of different presentations(domains) with this additional service)is possibleas additional payment. Establishing is ONLINE.After payment is received, web immediately ready for operation. The above prices are for one month of operation at yearly rate of payments . The billing period is yearly, always been paid for one year ahead. Without establishment fees. We offer 11 payment methods - bank transfer CZ,bank transfer SK, credit card, PayPal, superCASH, Platba24, Mojeplatba, ePlatby, mPeníze, GoPay.